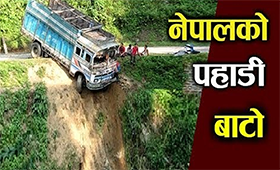 In this video we can see the craze of Pradeep Khadka in the valley. Pradeep Khadka is a Nepali actor, model, and film maker. He is best known for his role in Prem Geet. Pradeep has own production house which is known as Pradeep Media Pvt.Ltd. Pradeep started his career in 2011 as a film maker and actor. However, he was not popular before Prem Geet was released. Prem Geet was the movie that gave him a huge success and made him a popular actor overnight in Nepali film industry.